HomeService ProvidersHow a good VPN Service Protects you from Public WiFi Hotspot Hackers! Do you travel with a laptop, tablet or mobile phone and connect to the internet from public hotspots? If so, you need to protect yourself from hacking threats that exist at these public WiFi hotspots. The best protection is to use a good VPN, Virtual Private Network service when connecting to public Wifi. 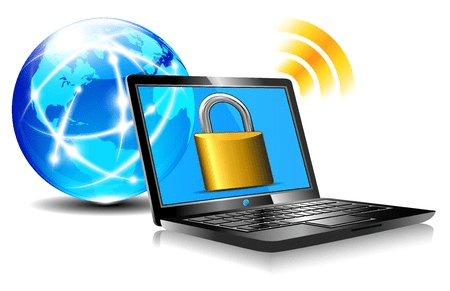 A good VPN service provides two types of protection, encryption and IP identification. Here’s how a good VPN can protect you against these common threats. 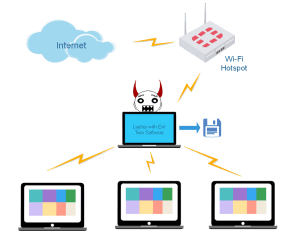 It’s easy for a criminal to set up an evil twin hotspot and in most cases, they only need a laptop computer to do it. 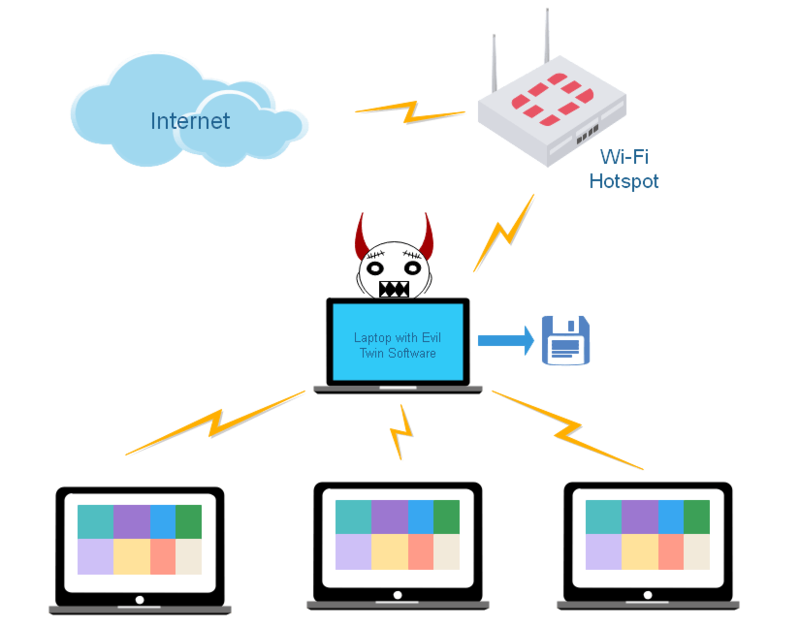 An evil twin hotspot is a fraudulent hotspot with the same identification as the authentic hotspot. The difference is that the criminal who set it up is capturing all the data transmitted by anyone who connects to it and the internet. Unless you are using an encrypted connection, the criminal can mine the captured data for usernames, passwords and other sensitive information transmitted. A good VPN service will protect you by ensuring all your data is encrypted, circumventing the criminal from minding captured data for your personal information. Do you think you are safe using the Hotels Wired Internet Connection? Think again! Network Packet Sniffers work on both wireless and wired networks to capture data. Sniffing software is readily available on the web, and anyone with a reasonable amount of technical skills can obtain and use this software. Hackers use sniffers to eavesdrop and capture unencrypted data. Again, they mine this data for your personal information such as usernames and passwords. Packet sniffers are especially alarming because they work on wired networks as well as wireless networks. The criminal can plug into a wired network and use a network packet sniffer to capture other people’s Internet traffic. The amount of data the hacker can collect depends on the network setup. In most hotels, the network setup is not that good. Again, a VPN service will ensure that both your wired and wireless internet data is encrypted, circumventing anyone from accessing your personal data. Don’t think you are safe because the hotspot uses WPA or WPA2 and requires a password. In some ways, Wi-Fi Hotspots that use WPA or WPA2 and require a password are more dangerous. 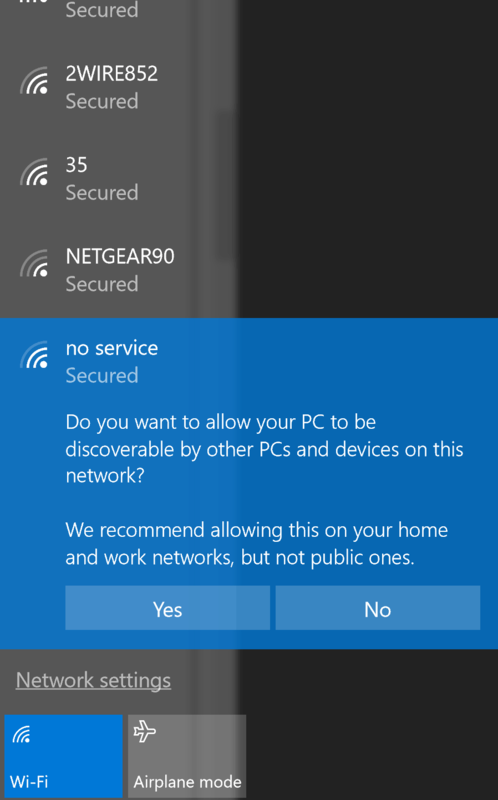 In Windows, when connecting to this type of Wi-Fi, it’s so easy to click on yes inadvertently when asked ‘Do you want to make your computer discoverable?’. The danger, besides Evil Twins and Packet Sniffers, is you are exposing the data on your hard drive to hackers. Additionally, most of these hotspots are consumer grade routers without the software that requires a web browser login and are not set up by IT professionals. They lack the security features of commercial hotspots making them easier for hackers to infiltrate and steal your data. How to protect yourself when connecting to these types of wi-fi hotspots. Never say yes to the question ‘Do you want to make your computer discoverable?’. And for good measure, open your Network and Sharing Center to check that the Active Network says Public Network underneath the network name. 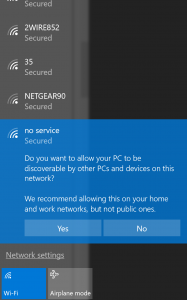 If it says ‘Private Network’ change it back to ‘Public Network’ which will enable your computer firewall. Please see Online Tech Tips for more information. Once connected, start your VPN software and connect to your VPN service. VPN Services I Use while traveling. I use two VPN’s. One is a service, and the other is the VPN server in my home router. Both work well, and they have their advantages and disadvantages. The VPN service I use is ExpressVPN. ExpressVPN is very easy to install and use, the connections are fast, they have 145 server locations in 94 countries, and they support OpenVPN making your connections very secure. The downside is some services such as Netflix, block their IP address preventing you from using some service. At home, I have a Netgear Nighthawk AC1900 VPN router. The advantage to using a VPN router is that you can access your home network, you don’t have to worry about IP blocks when accessing services such as Netflix, and Netgear uses OpenVPN, so your connections are very secure. On the downside, VPN Routers and their client software are difficult to setup. The maximum speed is only as fast as your home upload speeds, and you are using your home ISP data allotment for VPN connections. Stay away from the free VPN services. Free VPN’s are slow, lots of advertisements in the software, and some free VPN software’s contain spyware. Choose a VPN service with a server in your hometown or at the very least your home country. A VPN server in your hometown or country will give you an IP address in your home area. Using an IP address close to home prevents Banks, PayPal and Credit Card companies from placing potential fraud alerts on your accounts. A lot of VPN service providers tout hiding your IP address. Remember the reason why you want a VPN! You need to encrypt your internet communications on public hotspots and not hide your IP address as some of the bad guys try to do. Try a new VPN service for a month or two first before signing up for a year or more. You want to test drive the service before making a long-term comment. Do you have any recommendations or suggestions? If so, please leave a comment at the bottom of this page. Also, please check out the video below from my friends at ExpressVPN. 3 Comments on How a good VPN Service Protects you from Public WiFi Hotspot Hackers! Good article that most travellers forget to keep in mind. I highly recommend NordVPN, keep an eye out for discount codes and after trialing them out look to sign up for longer periods for a better discount. If you can also set up a home VPN then you’ll have the best of both worlds. Check out ASUS RT-AC66U for a home router which has an easy VPN setup. Thanks Mark for sharing the extra info. ColinR.